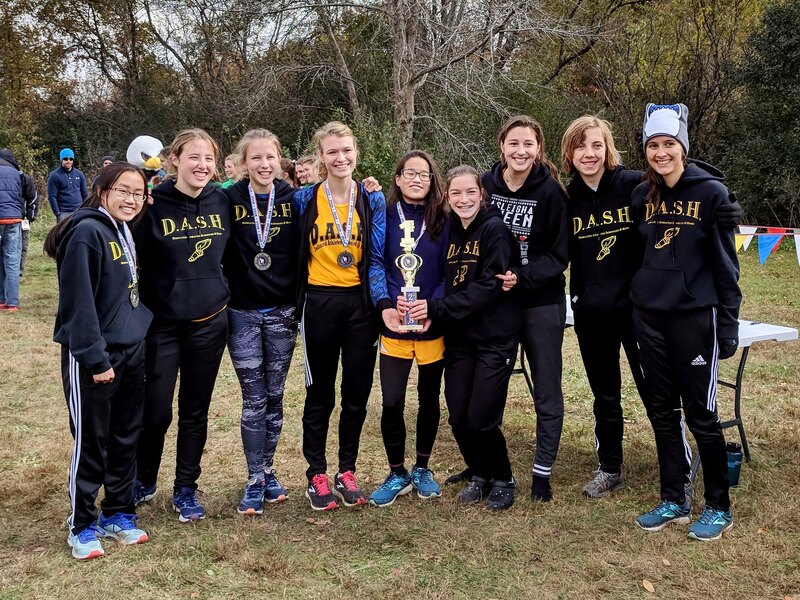 The DASH high school cross country ran on the meticulously groomed course of Armstrong Park at a meet hosted by The Prairie School. The weather was perfect and the course was fast. We posted some great times, and we took home our share of the medals. 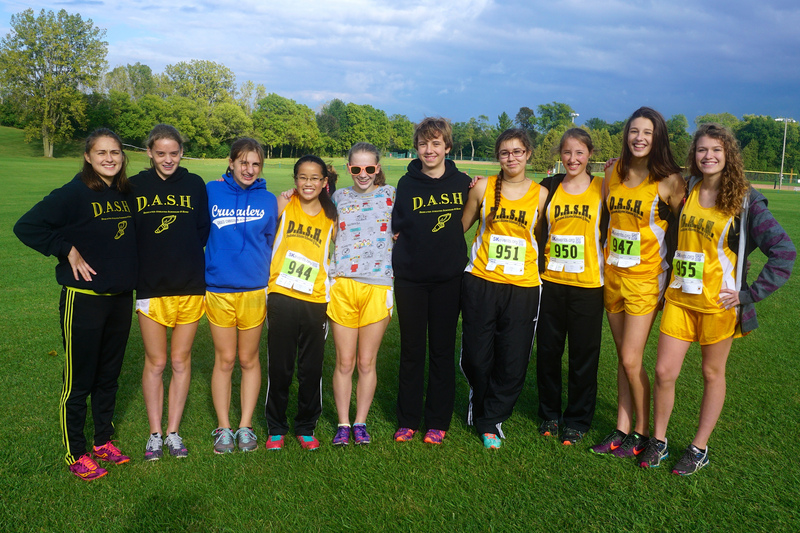 Andrea Kempf was at her best to lead the DASH girls. She had the lead early, and battled with the lead pack throughout. She finished in third place with an amazing time of 16:12. Heidi Jacobsen pushed her way to a season best time. She ran like a veteran, and she cracked the top-15 to capture a medal. Andrea Beck helped the team with her effort, but she is running with back pain and is going to need to slow down for the next few weeks. She did run to a 19th place finish, but she just does not look like the hard-charging Andrea Beck we are used to seeing. Senior Emily Caspers has been very reliable this year and this race was no exception. Emily was followed by Kaitlyn Hillman and Siobhan Heiss who both ran very well and lowered their season best times by almost two minutes. Amelie Kemmann was a few seconds behind Siobhan as she gets faster with each race. Kristin Ulfeng was much improved and finished 11th in the JV race. Emily McIntyre ran her first race of the year and finished well. The wait to see Kenny Hillman run was over. Kenny was coming off of an injury, but he looked even better than expected as his 6th place finish led the DASH boys. Kyle Hillman stayed up with Kenny throughout the race to give us a second top-10 finish. Jacob Dickman gave us three medal winners on the day with his effort. He broke 19 minutes for the first time as he keeps improving with each race. All eyes were now on Zachary Marek and he did not disappoint. He set his personal record and won a spectacular race to the finish against a St. Anthony athlete that got the DASH fans excited. Mike Chew looked very strong again, cutting another minute off of his best time. Matthew Wundrow started slow testing a sore hip. It felt good as he was able to move up in the last mile. Zebulon Caspers is getting healthier now and was able to set his personal record. Pete McIntyre ran in his first race and looked good. He will be one to watch. Jeremy Marek improved his best time by almost two minute as he gets faster with each race. The girls were announced as the 4th place team in a very tight field. We were only two points out of 3rd, and one point ahead of 5th. The boys matched the girls with their 4th place finish. We have always run short-handed at this meet in the past and have not scored well. This year, despite running a little short-handed again, our depth really showed, as we were still able to post some very good results. It proved to be a special day as the DASH fans were heard cheering for our five medal winners! Thanks to Pete Dickman and Jilleen Pfarr for getting the mile splits. Thanks to all the parents who made the drive to Racine. Thanks to Greg Kempf for helping watch all the little kids that I brought. Thanks to Faith Caspers for being the picture girl and taking the photos. Only one more high school meet before the Homeschool Championships. The season does go by fast. 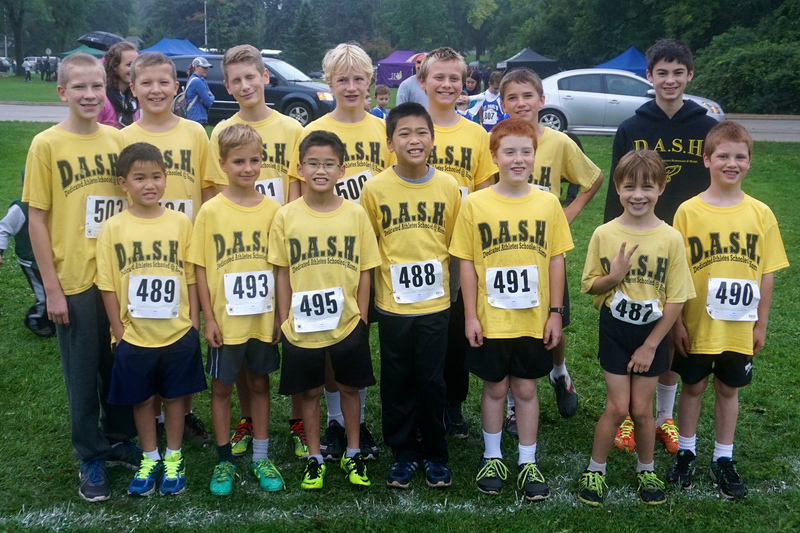 WCHSA moved their meet to Kettle Moraine Lutheran High School this year, so that is where the DASH middle school cross country team took the field yesterday. The meet was much bigger than in the past, so we would have to be fast. It was a blustery, but beautiful day to race, and yes, we did run fast. The 6th and under girls were first. The girls had all run great the meet before, and were looking to build on that success. Faith Caspers worked hard early and was able to stay in about 10th place for most of the way. On the home stretch Faith was in the back of a group of five girls, then she got into high gear and took off with an inspiring charge to move up and earn the 6th place medal! Kayla Walters was next with another very steady race. She cruised to a 30th place finish making it look routine. Mia Wickman and Grace Zinkgraf ran together the whole way and were both having great races. Mia started her sprint to the finish a few steps ahead of Grace and there was to be no stopping her. Grace got going as well and they were both able to really move up before they crossed the finish line. It is great to see these two running this well. Julianna Caspers was the smallest girl in the race, but she ran like a veteran. She was able to beat about half the field and caught the eye of many as usual. 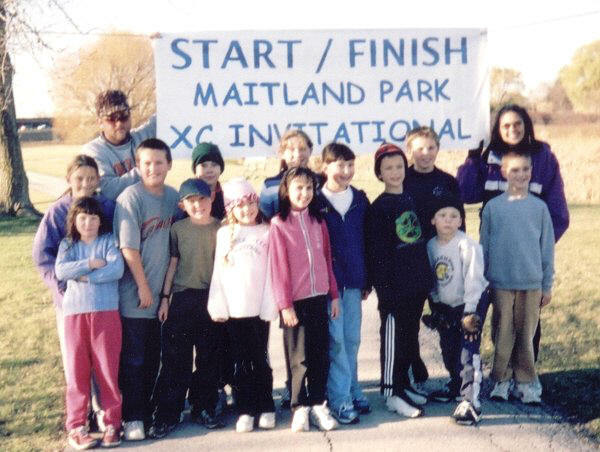 Our 6th and under boys team was actually 4th grade and under, but these guys can run. Leif Kostrzewa took off in the woods and never let up to finish an impressive 26th. Daniel Caspers was not far behind posting a great time and finished 38th. Joshua LeSac stayed with Daniel for most of the way and gave us all he had. These three all finished in the top third of their race. Not bad for these young guys! Elijah Anumolu was much improved in his second race despite getting knocked down early. He got up and ran well, and gained valuable experience. Zipporah Caspers had a great start, but she was running sick and it affected her racing as she headed back on the uphill portion of the course. She was still able to finish 23rd. A good day for most. Gulla Kemmann was running in her first cross country race. She put in a good effort and was able to beat about fifty girls. We will see how she improves. Our most competive team was to be our 7th and 8th grade boys. We had not raced most of the other teams yet, so we did not know how we would fare, we just knew that we would be a challenger for the trophy. Christian LeSac did his part as usual to keep our team score low. He ran with the lead pack the whole way and was able to beat all but one to the finish line. Briton Kostrzewa got out into 5th place early and was able to hold his spot the whole way, giving us another great race. We were hoping Christian and Briton would run in the top-5. They did not let us down. We still needed two more guys to give us great races. Joe Hughes got out to a great start, but he got the coach running around trying to keep him going as he started to fade after going up the hill. Samuel Zinkgraf started slow, but when he got to the hill the charge was on. Sam started moving up fast, eventually even catching up to Joe, which helped get Joe going again. Sam came charging home with Joe right behind, giving us the 26th and 27th place cards, and a total team score of just 60 points. We would have to wait to see if our score was low enough to win. Glenn Kaboskey was not at his best on this day, but an off day for Glenn is pretty good. He finished in the top third of the racers with his effort. Danny Wickman continues to improve with each race. He has hardly peaked yet, so look for him to go even faster before the season is over. At the award ceremony, the DASH fans got to cheer Christian LeSac for his 2nd place medal. I peaked at the team scores ahead of time and found out that one big team was able to beat us, so we knew our fate. It did help the DASH fans get ready to put out a loud DASH cheer for the boys 2nd place finish! We were able to run our best, so we were holding our heads high. Thanks to all the parents who made the drive up to Jackson. I know it is a little far, but we always have fun up there. Thanks to Mary Beck for being our official scorer. I will have to pick another mom soon. Thanks to the picture lady for taking the photos. Thanks to the athletes for all being where they were supposed to be. This is a good team to coach. Next week is the middle school team’s big week. Let’s eat healthy, do our exercises, get our rest and be ready! 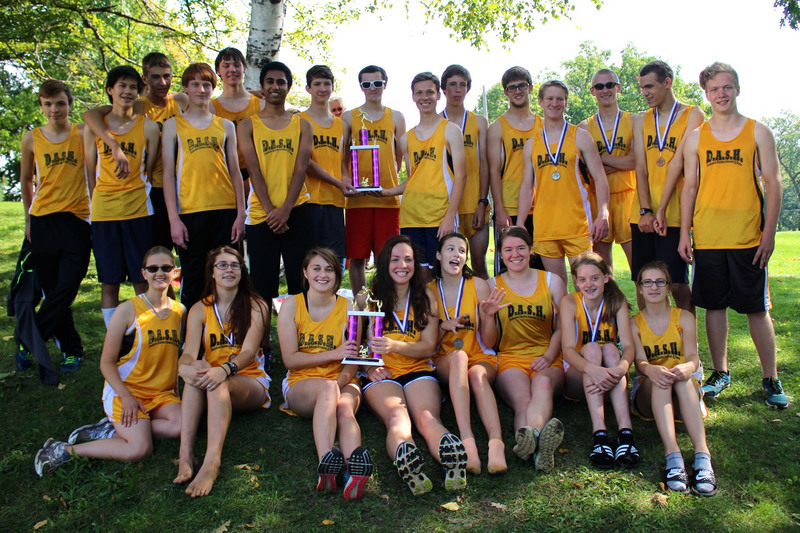 The DASH high school cross country team was back in action at Mitchell Park today, at least the healthy athletes were. 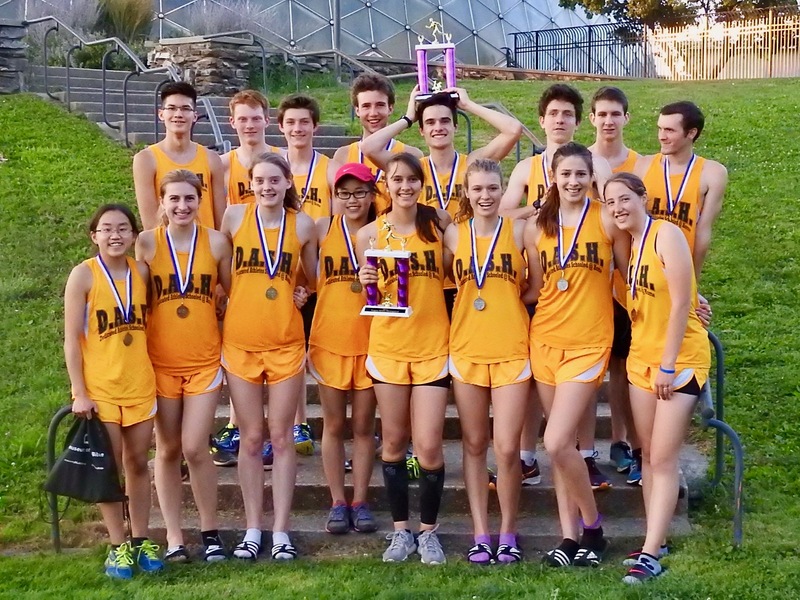 We fielded a small team, just nine athletes, but we ran fast and had some great results. The cold, damp weather that we started with turned perfect just in time for the varsity races which was just the opposite of last years rain and varsity cancelations. Andrea Beck paced our girls team. She stayed in the top-10 the whole way despite some back pain. She could not keep up with the Rufus King girls who posted a perfect score, but she stayed ahead of all but one of the other girls for a nice 7th place finish. Emily Caspers had her best race of the year on one of her favorite courses. She was very steady throughout and just missed a medal with an 18th place finish. Amelie Kemmann is really running good now. Running 4000 meters is becoming more routine for her, and she lowered her time from last week by over a minute to finish very close behind Emily. Kristin Ulfeng raced very competitively. She moved up in the last mile to post a good time. Unfortunately we did not have enough girls to post a team score, but it is encouraging how well the girls ran. Jacob Dickman was back to lead the DASH boys. Jacob took off in the last mile to move up all the way to 5th place in an impressive display of racing. He really got the DASH fans excited with his finish. John Sherman has improved every time out and this race was no exception. John is getting close to breaking 20 minutes now which is very good for a Freshman. Zachary Marek also set a personal best, breaking the 21 minute barrier. Zak has been practicing hard and his times are really reflecting that hard work. Zebulon Caspers has been a little sick lately so he started cautiously, but finished with his best time of the season. He felt very good at the end and will push a little harder at the next meet. Jeremy Marek made the boys five for five in setting personal bests as he continues to improve. Overall the boys were able to place 5th out of the eight teams posting team scores. That is a very impressive showing for such a young team running short-handed. These guys ran hard and made the DASH team look good. Thanks to Mary Beck and Ed Beck who were our official scorers. 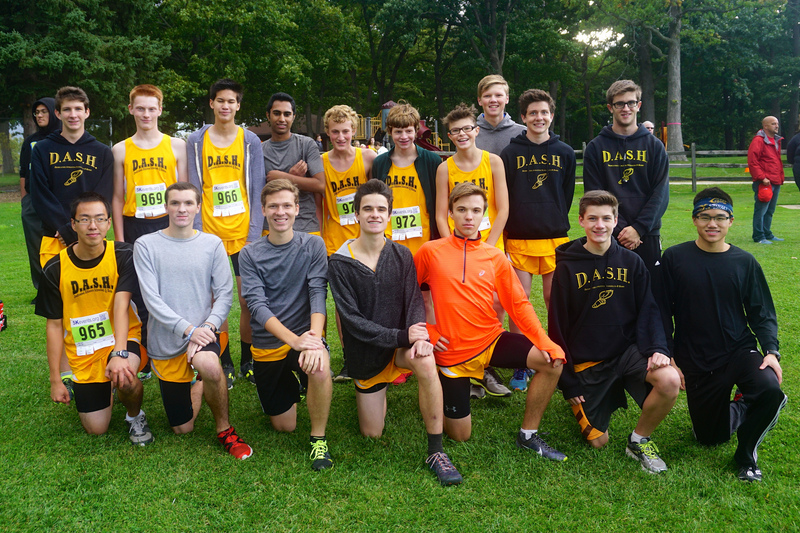 Thanks to Pete Dickman for collecting all the boys sweats and then biking around the course being a great DASH fan. Thanks to Andrea Beck and Jacob Dickman for winning medals and letting the DASH fans be heard at the award ceremony. Thanks to Faith Caspers for being the picture girl. The photos turned out pretty good. We have two more high school meets before the homeschool championships. This team is rounding into form. They will be exciting to watch. 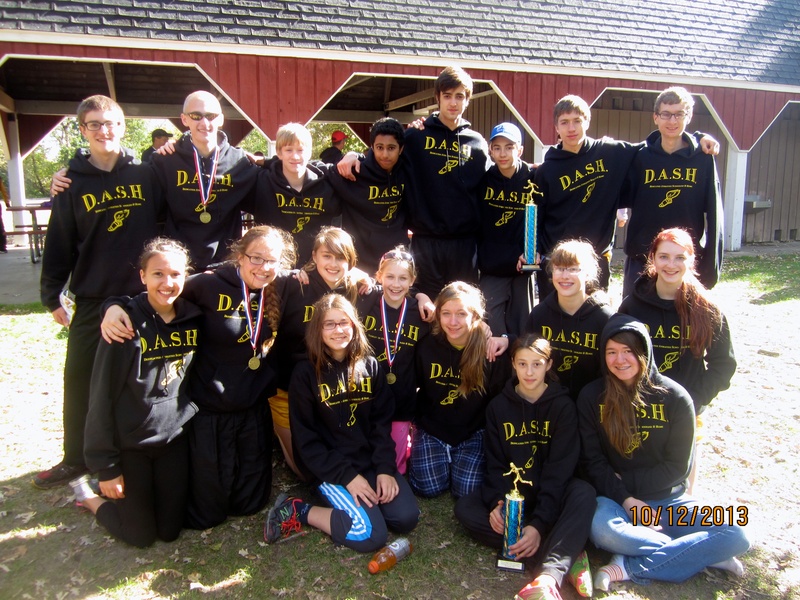 The DASH Eagles cross country team was back at Minooka Park yesterday. Coming off some good results at Whitewater the week before, and practicing well this week, we were looking to build on that success. We had some great individual results, but as far as team scores, it was a day of struggles. The boys were missing a few of their stars, but what turned out to be our biggest hindrance was the health of our team. Andrea Kempf was healthy and is really rounding into peak form. She ran with the leaders and set a new team 4k team record with a time of 16:48! Andrea Beck chose to run after being very sick the day before. Andrea raced the always steady Heidi Jacobsen up the big hill at the end. Heidi was also a little sick, but both girls were able to post some respectable times with gutsy efforts to help the team. Emily Caspers and Amelie Kemmann stayed together for the first mile and a half, with the more experienced Emily making it to the finish line first. Amelie showed some real improvement in this race. It will be fun to see much more she will improve in the coming weeks. Kaitlyn Hillman and Siobhan Heiss were next. They encouraged each other the whole way, with Kaitlyn moving ahead a little on the big hill. Makayla Gergeni was thrust onto the varsity team in her first race gaining valuable experience. She is going to be very good soon and is one to watch. Sophomores Ashley Hanus and Kristin Ulfeng put up some good times in the JV race to get our day started. I wish I would have had more time to run around and watch them. Kyle Hillman stayed strong until the end to lead our boys team. He got his time down to 19:06 on a very tough course. John Sherman’s race was also very good. He lowered his time by over 40 seconds from two weeks ago when we ran the same course. Mike Chew and Matthew Wundrow were back and running faster than ever. They came through with season best times and were our 4th and 5th scorers. Zebulon Caspers was also to post a season best time as he continues to speed up with each race. The Nyhart brothers, Hudson and Ransom, decided to run despite not being close to 100% healthy. Both were not able to take deep breaths without coughing and really struggled. Ransom is so talented that he was still able to be our third runner in, but Hudson was not able to make it to the finish without stopping several times. Let’s hope they get past this quick. Even though we posted some disappointing team scores, we do have a lot to get excited about. The team has been running good in practice, and the healthy athletes all had some good times. 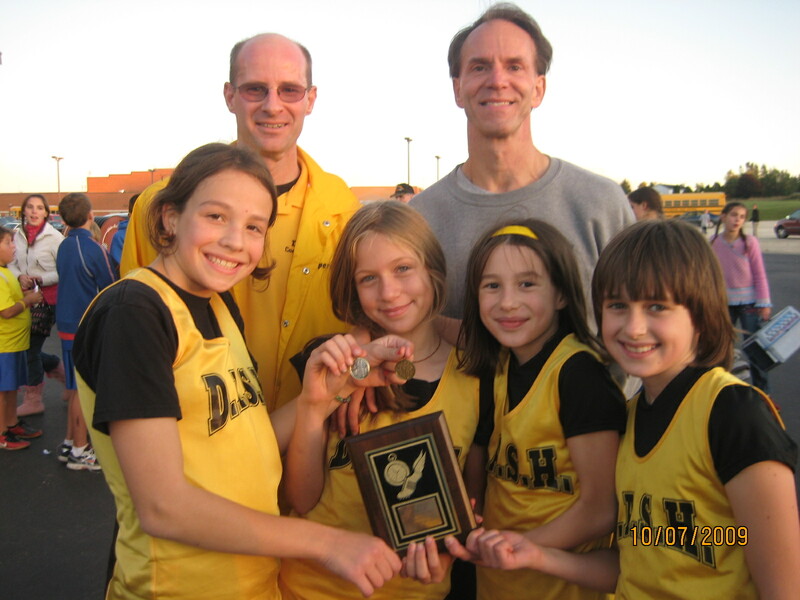 The DASH Eagles fans were heard from at the award ceremony as Andrea Kempf received her 12th place medal. Now we have to get healthy, and get ready for two of my favorite meets. They are on faster courses with smaller fields, and I expect us to be very competitive. You will not want to miss it. Thanks to Ed Beck and Drew Heiss who helped me get the athletes ready at the start. Thanks to Jilleen Pfarr who signed us up for the meet and got all the paperwork squared away. And thanks to all the picture people who took the photos. Next week we are at Mitchell Park. I hope to see you there. 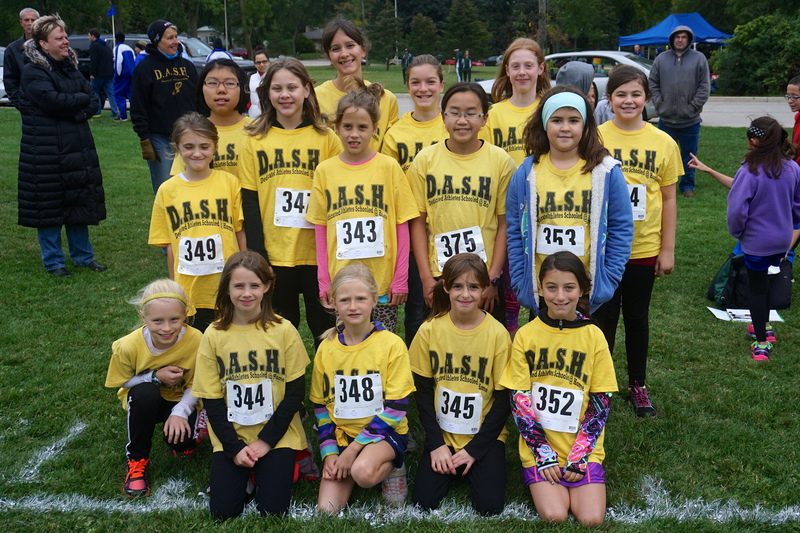 The DASH middle school cross country team was back in action at Grant Park last Wednesday. It was a gorgeous, but warm, sunny day. With the experience of Monday’s meet behind us, the goal for this young team was to push a little harder and try to move up in the standings. The results were exciting. In the girls 7th and under race we were without DASH stars Lucretia Nyhart and Abigail Larkin. 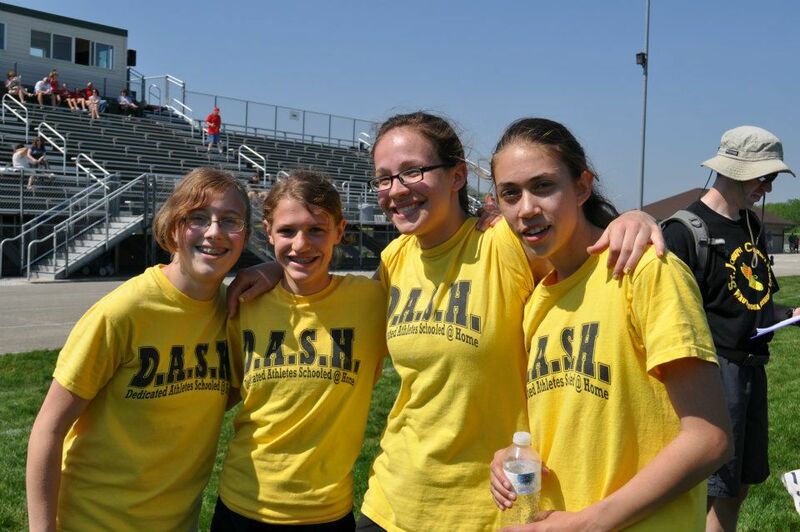 Julianna Caspers was asked to don the DASH yellow a meet earlier than planned to help us out. Then we found out that Grace Zinkgraf planned to run as well, so we ended up with seven girls ready to race. Things were going well. All the girls got off to good starts. Faith Caspers ran with the leaders early, but did show signs of tiring. All the other girls were right where I hoped they would be, except for Grace Zinkgraf, she was much better. In this her first cross country race, Grace was the third DASH girl to pass and did not even look tired. Yes, the coach was getting excited! Before heading into the last turn, Faith was looking stronger and was able to make a late charge to move up to 6th place and capture our first medal. Kayla Walters was next with another impressive showing. She has turned into a very dependable racer. New DASH star Grace Zinkgraf stayed fast to the end and cracked the top-100 in an amazing first race. Now the rest of the DASH girls started coming in fast. Rebekah Marek was caught flying to the finish to be our fourth scorer for the second straight meet. She really improved from Monday’s meet. Julianna Caspers impressed as always. She may be small, but she knows how to race. Mia Wickman and Alivia Kempf each had their best races. Their improvement over Monday’s showing is astounding. If you watched the race to the end you would have seen over 120 more girls cross the finish line, with no DASH athletes among them. All of these girls are running well and keeping the coach smiling. The 7th and under boys picked up right where the girls left off. Briton Kostrzewa was even more impressive this time out. He took off in the middle of the race and moved up all the way to 2nd place. He held that spot, while increaing his lead over 3rd, all the way to the finish. The DASH team has won a lot of top-10 medals at this meet over the years, but we have never had an athlete place as high as second. The coaches were asking me where I found Briton. He is getting noticed. Leif Kostrzewa started fast and stayed fast, never seeming to tire to be our second runner in. Get used to Leif being one of our stars. Joshua LeSac is running with confidence right now. He is racing faster than ever, and challenging anyone nearby. It is great to see. Daniel Caspers did not have his best, but he stayed with Joshua until the end and cracked the top-100. Westley Marek and Joshua Anumolu, with Monday’s race under their belt, posted great times, and left more than half the field behind them. As good as they ran, I still look for them to improve even more as the season goes along. It was nice to see Elijah Anumolu in the race. He struggled, but made it to the finish. He can run fast, but is still learning how to pace himself for this distance. With some more practices he will be moving up soon. Zipporah Caspers, with the help of her personal coaching entourage, was next in her attempt to capture another medal for the DASH team. Everything went according to plan as she got out fast and stayed in the top-5 heading into the last loop, but their was a big pack of girls close behind looking to move up. Zipporah has had trouble holding her spot at the end of races in the past, but her hard work this summer showed, as she was able to cross the finish line ahead of all but five, thus earning herself and the DASH team yet another top-10 medal. In the 8th grade boys race, Christian LeSac and DASH newcomer Joe Hughes ran with the leaders early, with Sam Zinkgraf lurking right behind. Christian, running in third well ahead of fourth, crossed the mile mark in 5:45. Heading in to the last loop the two runners ahead of Christian were in a titanic battle for first, but Christian actually closed the gap on them before finishing with another impressive third place finish. Christian is one who usually improves a lot as the season goes along. We will see what he can do for an encore this year after his early success. Joe Hughes had a great first DASH race, placing 19th overall. He can run. Let’s hope he can get to a lot of our upcoming races. Sam Zinkgraf is really running strong right now. You can tell he has been working hard, and he is posting some great times. 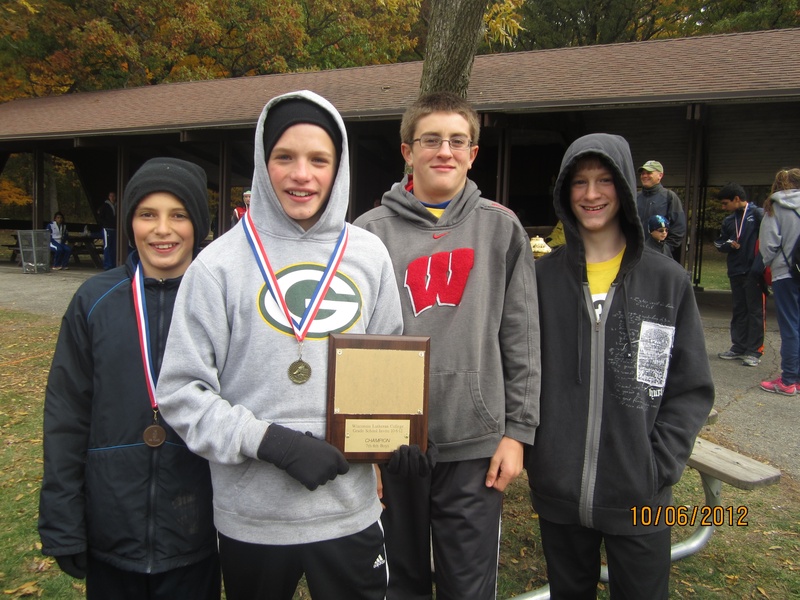 If we can get all my 8th graders together for a race, we will be tough to beat. 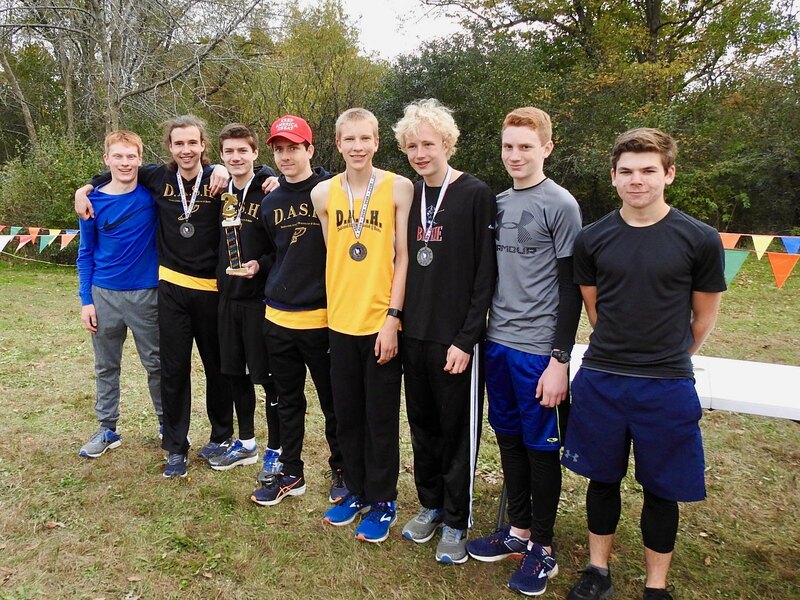 We fielded just 18 athletes, yet racked up four top-ten medals, placed 16 athletes in the top half of their races, and were the only team to have a top-6 finisher in every race. That is competing to our abilities, which made it yet another epic day of DASH racing! Thanks again to Mary Beck for being our official scorer. Thanks to Andrea Beck and Andrea Kempf for helping out with the coaching. 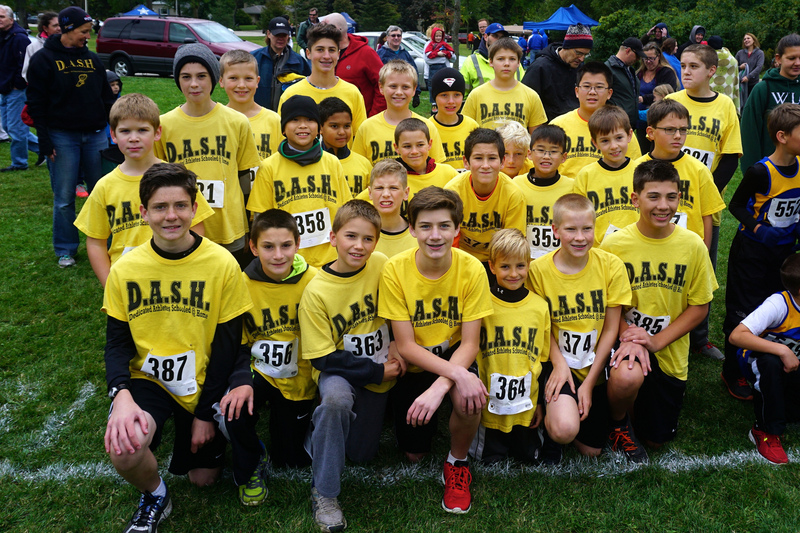 Thanks to the parents and athletes who were everywhere lining the course being great DASH fans. And thanks to my wife for taking the photos so we can remember how much fun we all had. 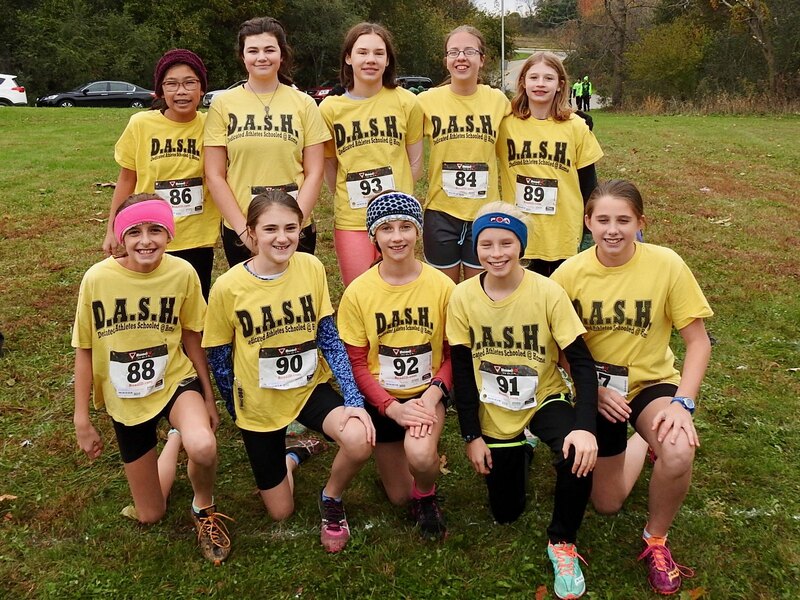 The middle school cross country team finally got to take the field and compete in the big Lake Denoon middle school meet in Muskego last Monday. The weather was perfect for posting some good times, and that we did. Not everything went as planned, but overall the team ran well. 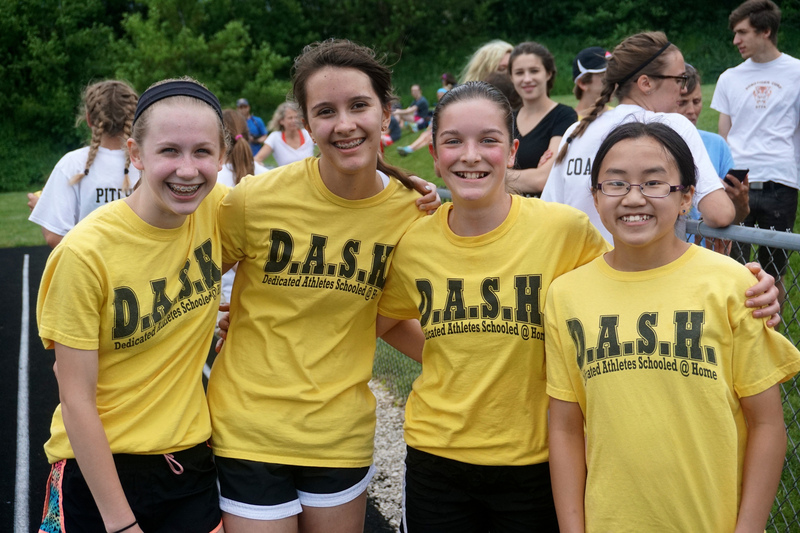 This should be another exciting year of DASH middle school racing. We drew box 9 of the 20 starting boxes putting us right in the middle of the action. 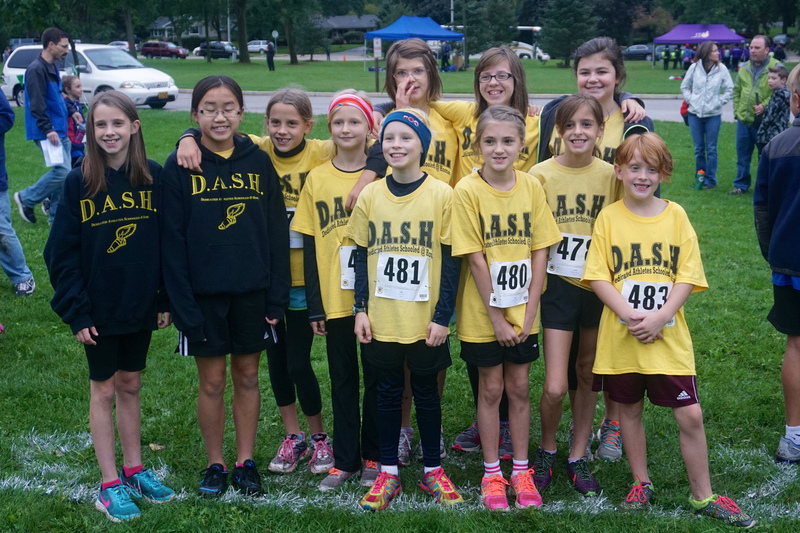 It proved costly because when the 7th and under girls got going, yellow DASH jerseys were seen down. We could not tell who it was at first. Rebekah Marek was one that was down, but she was able to get up and continue. As the pack pulled away, a deflated sigh was heard as Abigail Larkin was left sitting, holding her knee in the middle of the field. We rushed over to help. She was eventually able to walk off on her own power, but her promising day was done. We found Abigail an icepack, and she headed for home. In the meantime, Faith Caspers, wondering what happened to Abigail, was running inspired and having one of her good days. She captured the 12th place medal for her efforts. Kayla Walters and Lucretia Nyhart were next with Lucretia showing a little more kick at the end to finish ahead. Rebekah Marek, in her first race, got up to finish as our fourth scorer. She has a lot of potential and is one to watch. Mia Wickman and Alivia Kempf, both much improved from last year, completed our team. The 7th and under boys were next. New DASH star Briton Kostrzewa ran a very smart race, moving up in the last half of the race all the way to 8th place, earning a medal for his efforts. The little guys were next, and they were all amazing. 4th grader Daniel Caspers outkicked 2nd grader Leif Kostrzewa at the end, both finishing in the top 70. That was out of over 270 athletes in the race. They are setting the bar high. Fourth grader Joshua LeSac also got the coach excited, having his best race ever to complete our team scoring. DASH newcomers Joshua Anumolu and Westley Marek looked good in their first races. We should be hearing about some good results from those two in the upcoming weeks. Zipporah Caspers got all the DASH attention in the 8th grade girls race. She got out to a good start and pretty much held her place throughout to finish in 13th place. 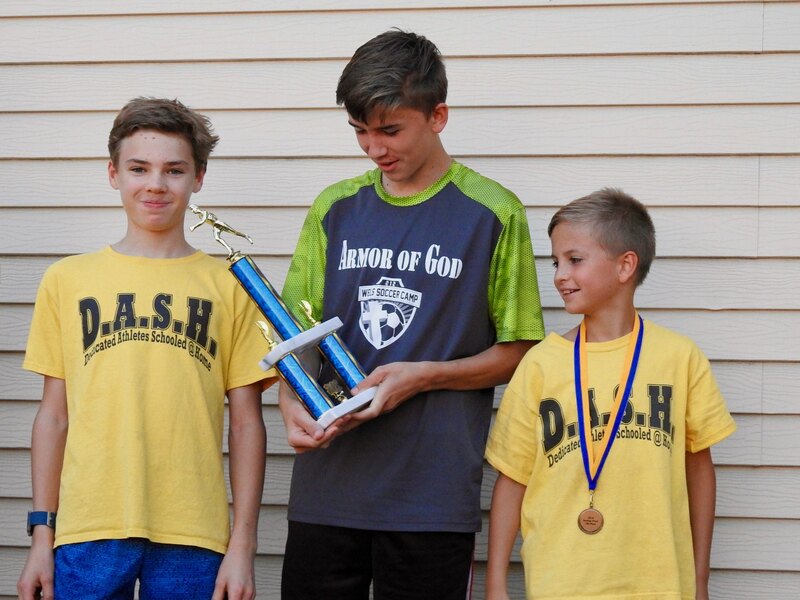 It was a good start to the season from the DASH teams’s longest tenured middle school star. The 8th grade boys were next. This is a fast group and they showed off their speed in this race. Christian LeSac showed us why he is a DASH superstar. He ran this course faster than any DASH athlete has ever run it to give us a 3rd place finish. Glenn Kaboskey and Samuel Zinkgraf both challenged each other throughout, pushing each other to the 32nd and 35th place numbered ribbons. Glenn and Sam are accomplished runners and they looked like it. DASH track start Danny Wickman showed us that he can run cross country as well. He is much improved from last year, and he is one I will be looking to get faster and faster as the season progresses. Christian Lesac made the DASH team proud and the DASH fans boisterous at the award ceremony, receiving his 3rd place medal to loud cheers to cap off another day of DASH racing. Thanks go out to Mary Beck for being the official scorer. Thanks to Andrea Beck for being assistant coach and taking most of the photos. Thanks to Lake Denoon coach Mark Ertl for getting the icepack for Abigail’s knee. Thanks to the parents for getting the athletes to the meet and being great DASH fans. Thanks to the athletes for all getting to the starting box on time. 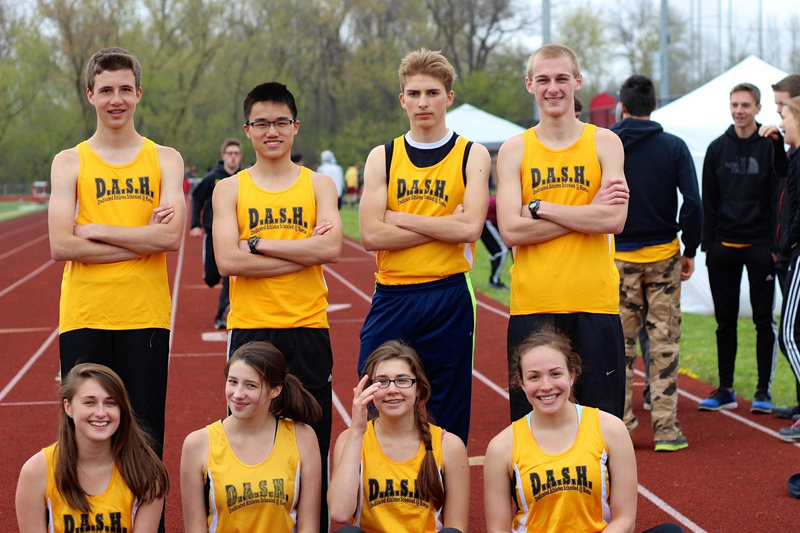 I have had problems in that department in past years at this meet, but not with this team. We get to watch this group again at Grant Park. I hope to see you there. 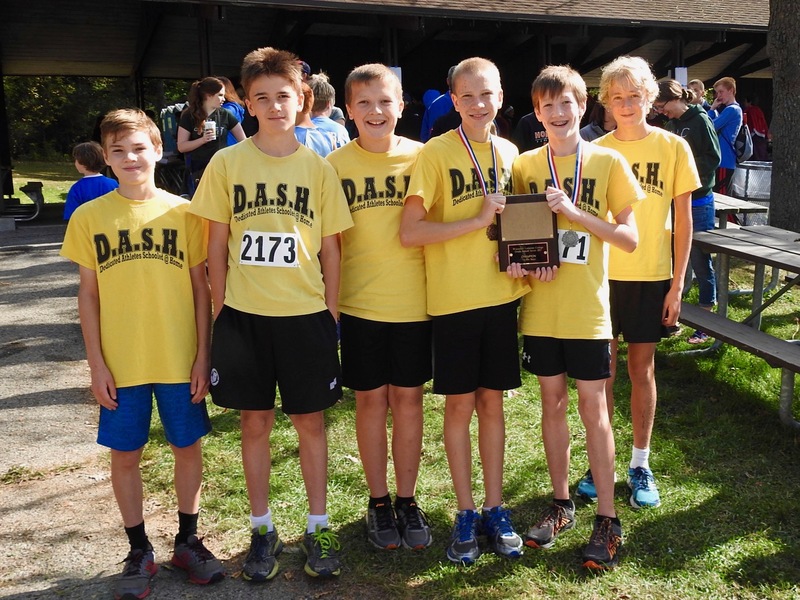 The DASH high school cross country team fielded our strongest team yet in Whitewater yesterday, competing in the Whippet Challenge. We were very competitive against a few of these teams at our last meet, and we hoped to move a little higher in the team standings this time. We arrived to find a cold front passing through that also brought out the rain. It was a struggle to stay warm before the girls race, but fortunately the rain died down just about the time the girls were scheduled to race donning the green Eagles jerseys. Andrea Kempf got the DASH fans excited early as she challenged for the lead through the first mile of the long 5k race. Andrea Beck also got out fast and looked strong running near the leaders. Heidi Jacobsen and Emily Caspers were running well through the first mile, with all our other girls running very close together a couple minutes behind. After coming down the big hill for the second time and heading for the finish, Andrea Kempf was still among the leaders. She ended up in 7th place with an amazing time of 21:59! That’s fast! It was a short wait to see Andrea Beck’s charge to the finish. The long race did not slow her down as she finished an impressive 15th. Her hard work is paying off. Heidi Jacobsen was next, giving us another great race to keep our team scoring very low at this point, which really built the excitement and made the DASH fans wait for the next athlete to arrive seem long. The length of the race slowed the rest of our athletes, but Emily Caspers and Kaitlyn Hillman arrived just in time. I will tell you more about that later. Siobhan Heiss was a few paces behind Kaitlyn as she continues to improve. Amelie Kemmann was next with her usual fast finish as she still tries to adjust her sprinter speed to cross country races. Freshman Courtney Sigmund impressed the DASH fans in her first race. Ashley Hanus gained some more valuable experience in her second race. Freshman Renee Walters, in her first race, started well but lost some confidence on this hilly course. We will keep working with Renee because I know she’s fast. Jacob Dickman and Ransom Nyhart set the pace early for the DASH Eagles team in the boys race, staying within the top-10 throughout. Hudson Nyhart also got out fast, followed closely by Kyle Hillman, Aaron Vogel, and Zachary Marek, with Zebulon Caspers and Jeremy Marek pacing themselves a little ways back. In the end, Jacob Dickman’s hard work this season paid dividends, powering him to a 6th place finish. Ransom Nyhart was right behind in 8th place giving the DASH team two top-10 finishes! But the good results were only beginning. Kyle Hillman had a great finish, moving up all the way to 14th. Aaron Vogel and Hudson Nyhart put up some nice times to assist us in posting a very low team score. Zachary Marek was not far behind Hudson, proving our depth while adding points to other teams as our pusher. Zeb Caspers and Jeremy Marek keep improving with each race, both giving good efforts to complete some great boys racing. After the boys race we could not find the boys sweats that were left behind the start line. It turned out that ours, along with another teams stuff was stolen. Very disappointing and the low point of the day. Fortunately our minds were turned toward the awards ceremony. Andrea Kempf received some loud DASH cheering as she received her top-10 medal. After hearing the girls announced as the 4th place team, and by one point no less, the DASH Eagles fans were heard from once again. I told you Emily and Kaitlyn were just fast enough! Ransom Nyhart was next, followed by Jacob Dickman, to be announced as top-10 finishers to loud DASH applause. Then the wait to hear how the boy’s team placed overall began. When three teams were left and we were not yet called, the tension mounted. Could we take second? The Prairie School was announced as the third place team and we finally knew our fate. Yes, the DASH Eagles were second! (Extremely loud DASH Eagles cheers in the background, along with plenty of high-fiving.) We left with a less stuff than we came with, but with some smiles on our faces. Special thanks to all the parents who made the long trek to Whitewater. We do have some closer meets coming up. Thanks to Lisa Dickman for getting the mile splits. Thanks to Dawn Kempf for encouraging everyone up the big hill. Thanks to Maura Heiss for bringing the uniforms. Thanks to Faith Caspers for the photos. Thanks to the whole team, parents and athletes, who made it through the cold and the rain, and were there to witness all the great racing. But as good as we ran, I still don’t think we have witnessed our best yet. Stay tuned while we get faster in the coming weeks. You won’t want to miss it. 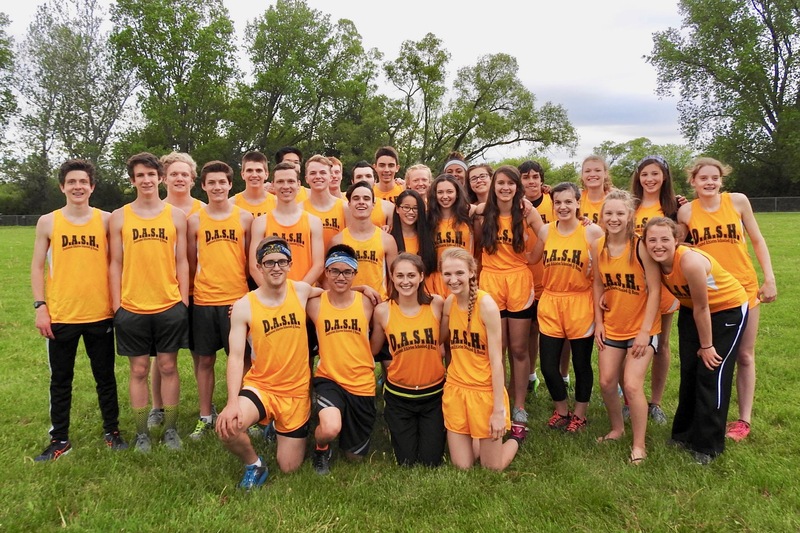 The DASH high school cross country team was out at Minooka Park this Saturday morning running in the Blackshirt Challenge. We did not field our largest team because of the holiday weekend, but the dedicated athletes who participated gave us a great effort, and when the results were tabulated, it was our best showing ever at this meet. The boys ran first again. 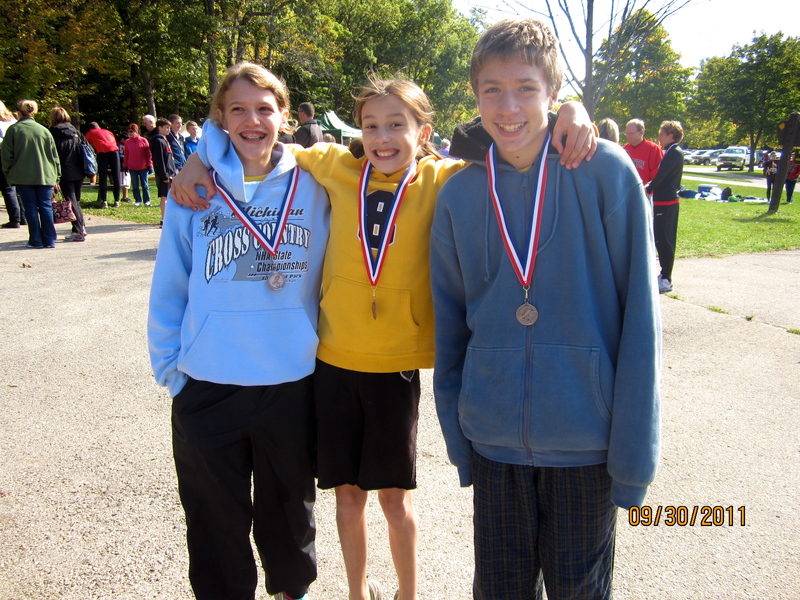 Freshman Jacob Dickman was our number 1 guy from the start. He was able to keep his torrid pace up throughout the race, and in the end was the 5th freshman to cross the finish line. Nice! John Sherman arrived just in time, and with some great racing of his own was our second man to the finish. Senior Zachary Marek was next. He looked like a senior, running strong and lowering his time by about a minute from last week’s race. Mike Chew and Zebulon Caspers stayed close for the first two miles, then Mike picked up the pace in the last mile to be our fourth runner in. Zeb was able to lower his time by over three minutes from his first race which is encouraging. Jeremy Marek also showed vast improvement in his race, lowering his time by over two minutes. This team is getting fast. The girls were next, with everything going as planned. That will keep a coach happy. Andrea Kempf and Andrea Beck went out fast and raced with the leaders. In the end Andrea Kempf finished in 15th place, exactly like last week. Her time of 17:27 is good for a new DASH record! Andrea Beck was less than a minute behind, giving us her usual great race. Heidi Jacobsen and Emily Caspers raced together early with Heidi moving ahead at about the mile. Heidi’s charge up the big hill before the finish is the best I’ve seen capping her great race. Emily gave us the time we were hoping for from our fourth runner, and Kaitlyn Hillman was able to cut two minutes off of her time to give us another much needed good finish. Ashley Hanus showed us some potential in her first race. She may be one to watch. In the team scoring we held up well. 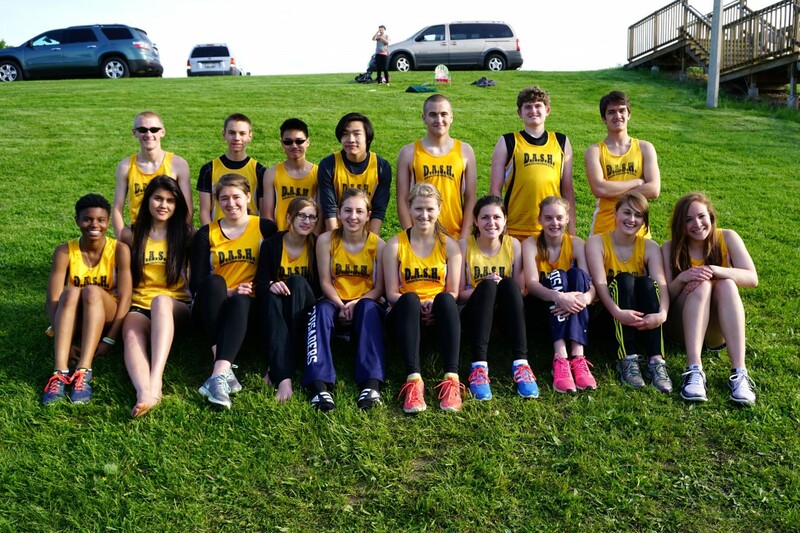 The girls and boys both ended up in 9th place. We will take that, and look to build on it in the coming weeks, hopefully running with more of a full team. This team is posting some good results now, and it is going to get better. It will be fun to watch. Thanks to Pete Dickman and Jilleen Pfarr for helping out with the coaching and getting the mile splits. Thanks to Ed Beck for running around with me to catch all the action, and for his usual words of wisdom. Thanks to the parents who got the athletes ready to race. Thanks to the athletes who were caught running around cheering on their teammates. Thanks to Andrea Beck for accepting Andrea Kempf’s medal at the awards ceremony, proving you can never have too many Andrea’s on your team. And thanks to the picture lady who took the photos, even with baby Philip at the meet. We get to do it again next Friday in Whitewater. I hope to see you there.